The Vimala Temple or Bimala Temple is a Hindu temple dedicated to goddess Vimala (Bimala), located within the Jagannath Temple complex in Puri in the Indian state of Odisha. It is generally regarded as a Shakti Pitha, among the holiest temples dedicated to the Hindu Goddess. The temple is located in the south-west corner of the inner enclosure of the Jagannath temple complex and on the western corner of the tower of Jagannath, next to the sacred pond Rohini kunda. The temple faces east and is built of sandstone and laterite. It is built in the Deula style with four components; vimana (structure containing the sanctum), jagamohana (assembly hall), nata-mandapa (festival hall) and bhoga-mandapa (hall of offerings). 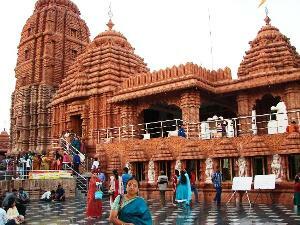 The temple was renovated around 2005 and is maintained by the Archaeological Survey of India, Bhubaneswar Circle. Though a small shrine in the temple complex, the Vimala temple is important to the Goddess-oriented Shakta and Tantric worshippers, who revere it even more than the main Jagannath shrine. Vimala is considered to be the Tantric consort of Jagannath and a guardian of the temple complex. Devotees pay respect to Vimala before worshipping Jagannath in the main temple. Food offered to Jagannath does not get sanctified as Mahaprasad until it is also offered to Vimala.